Artist's illustration of a potential NASA lander on the surface of Jupiter's icy, ocean-harboring moon Europa. NASA's potential lander mission to Jupiter's ocean-harboring moon Europa may start taking shape soon. 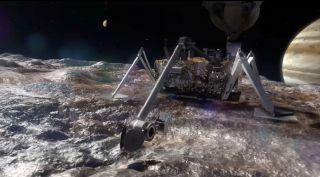 The agency has asked scientists to submit their ideas for instruments for the multibillion-dollar lander, which would look for signs of past or present life on Europa at or near the moon's icy surface, among other work. Europa, which is a little smaller than Earth's moon, has a huge ocean of liquid water beneath its icy shell. NASA is currently developing a Jupiter-orbiting mission called Europa Clipper, which is scheduled to launch in 2022. The mission will investigate the Europa ocean's life-hosting potential, gathering data during 40 to 45 flybys that get as close as 16 miles (25 kilometers) to the moon's surface. And Europa Clipper may even be able to grab samples during some of these flybys. A plume of water vapor appears to emanate from Europa, at least intermittently. It's unclear at the moment if this material is coming all the way from the ocean, or from a reservoir closer to the surface. Compared to the Clipper mission, the battery-powered Europa lander is on less solid ground; it's a concept at this point, not an officially approved mission. But, as the new call for proposals shows, NASA is working to flesh out the project's scientific activities. Current thinking about the potential lander envisions a launch no earlier than 2025, aboard NASA's in-development Space Launch System rocket, and a landing on Europa six years later. Mission team members have said they aim to keep the possible lander mission's cost under $3 billion. In late 2015, Congress directed NASA to investigate the possibility of adding a lander component to Europa Clipper. The agency subsequently determined that launching the lander separately, after Clipper, would be the best way to go.